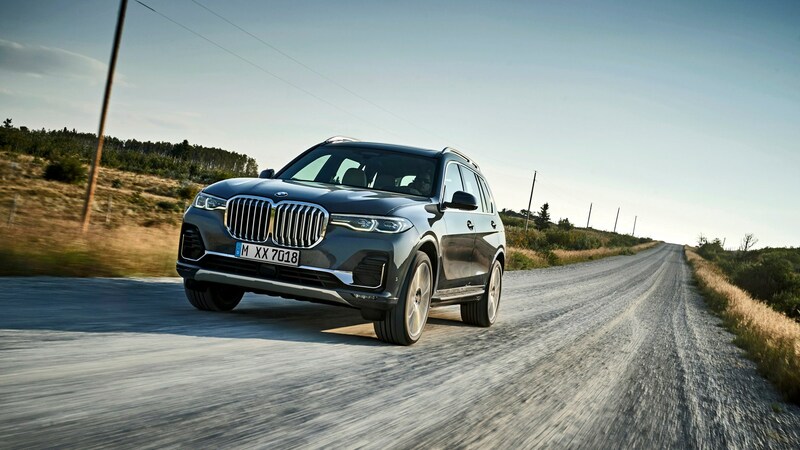 It’s been 20 years since the BMW X5 reimagined the SUV with its car-like dynamics and good enough off-road capability. Its success opened the door for a range of smaller X models and five-door coupe spin-offs, but BMW has never ventured into larger, more profitable Range Rover territory – perhaps ironically given it funded the previous generation Rangie. But now it has with the X7. Prices start from £72,155, and you won’t see many about: BMW hopes to shift around 800 a year here – a tenth of the X5’s it registered in 2018. It’s huge. But, despite what the challenging Buckingham Palace front grille suggests, BMW’s biggest car is not abnormally mammoth. At 5151mm long and over 2.3 tonnes, the X7 sits between the slightly smaller and lighter Range Rover and the slightly larger and heavier Mercedes GLS. A 7-series is a bit shorter, the long-wheelbase version longer, both dwarfed in height, width and weight. The X7 shares its basic CLAR architecture with the 7-series, but it does not feature the 7’s Carbon Core construction, in which carbonfibre is used in places like the transmission tunnel and cant rails alongside aluminium and steel. That’s because the X7 is not built in Germany like the 7-series, but at BMW’s Spartanburg plant in the USA. We’re told that while BMW does source carbonfibre for its i cars in the US, it’s too costly to productionise here. ‘In this class, you might as well invest in extra equipment,’ explains our source. Equipment is certainly generous: the xDrive 40i gets 21-inch alloys, air suspension, panoramic sunroof, comfort access with soft-close doors and the new bells and whistles iDrive 7.0 – you can talk at it, wave fingers in the air near it, touch a screen, twirl a dial, and it all works fabulously well, despite that seemingly over-complex interaction. 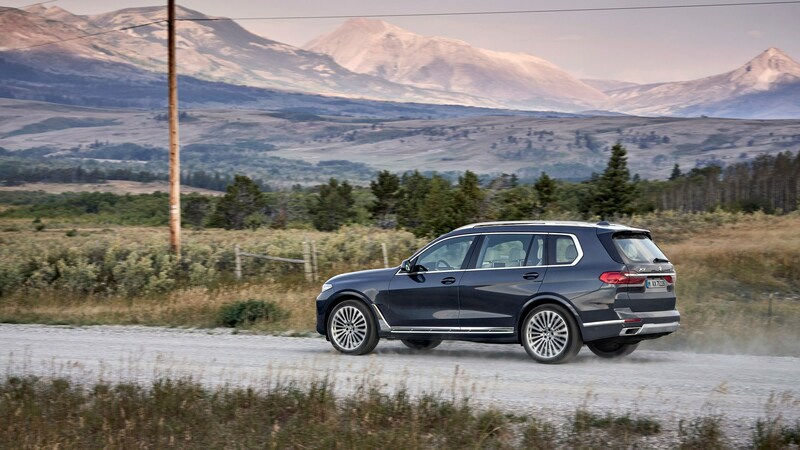 There’s also a suitably rich and luxurious feel to the cabin, from its extended leather and excellent build to the dual 12.3-inch digital screens and a gearknob and rotary iDrive control like a crystal decanter. It almost makes you forget the 2.3-tonne kerbweight. There are three at launch in the UK, all six cylinders. We’re testing the xDrive 40i, a turbocharged 3.0-litre with 335bhp and 332lb ft that returns 32.5mpg and 198g/km. It costs £74,155. A pair of 3.0-litre diesels is also available. The £72,155 30d will be a popular choice thanks to its combination of 261bhp/457lb ft with over 40mpg, but the quad-turbo 50d sounds a monster. Costing £87,240, it makes 394bhp/561lb ft, still just tops 40mpg, and manages to propel 2460kg from zero to 62mph in 5.4 seconds. We’re told the M50i will join the line-up later, packing over 500bhp. All X7s get all-wheel drive and an eight-speed auto gearbox. BMW has targeted even greater comfort than the 7-series, and it’s certainly a serene environment with air suspension and – the engineers are very proud that they fought for this one – fluid-filled suspension bushings. There’s a cushioned lull to suspension movements, but while this is very much a comfort-focussed experience, it never feels like you’re sloshing about because suspension movements are so nicely regulated. The seats are highly comfortable, it’s as if wind- and road-noise has been snuffed out by goose-down pillows, and the Bowers and Wilkins hi-fi in our car basically turned the entire cabin into a pair of expensive noise-cancelling headphones. It goes well too, and even the xDrive40i never feels underpowered despite all the mass it has to lug: max torque from 1500rpm gives it an easy-going nature at lower speeds, its smooth through the rev range, and it pulls well when you really floor it too. Even the purposeful but subdued exhaust note fits the bill. The M50i launch date is TBC, but we did try a US 5.0-litre V8 with around 60bhp less, which sounded suitably fruity and showed no lack of enthusiasm for punching 1.8-metre high holes through the air. The M50i should feel incongruously quick. Does it go around corners? Despite the cushy ride, BMW engineers have targeted best-in-class dynamics – indeed, one chassis expert with a background in WTCC and DTM was quick to quash any fears that this would be BMW’s least dynamic car (and mumbled something about front-wheel-drive 2-series). Chassis tuning was even conducted at the Nürburgring. Apparently the chassis engineers reached an impasse until someone suggested they changed tack from a conservative chassis set-up to one as agile as possible, with software for the all-wheel drive, steering, differential and suspension layered on to keep owners out of trouble. ‘It took two months but immediately it went five seconds faster at the Nürburgring,’ says our man. You’d certainly move out of its way on the touristfarting days. We didn’t drive it on the ’Ring, though. Our test route took us from BMW’s Spartanburg plant to Savannah, Georgia, which unfortunately conformed to the Americans-only-drive-on-straight-roads stereotype we know to be largely rubbish. But on the few freeway on-ramps and corners we did experience, the steering had a familiarly pacey, weighty and precise feel, and the X7 certainly turned in well, resisted roll, gripped hard and felt suitably rear-biased when driven more aggressively. It feels both far more dynamic than expected, and like a much smaller, nimbler machine that the proportions suggest, but only UK roads will paint the full picture. Does the X7 actually go off-road? It does. Ground clearance of 221mm, all-wheel drive and air suspension that can be raised by up to 40mm should more than cope with most owners’ demands, but BMW is happy to leave the really serious terrain to Land Rover, barely mentions off-road capability in the press material and didn’t include any off-roading on the press launch. It’s also telling that the xOffroad package is optional, with four off-road modes (the unnecessarily pre-fixed xSand, xRocks, xGravel and xSnow), mechanical diff lock and sump guard. Can it do tip runs? Carry three generations at once? You can. 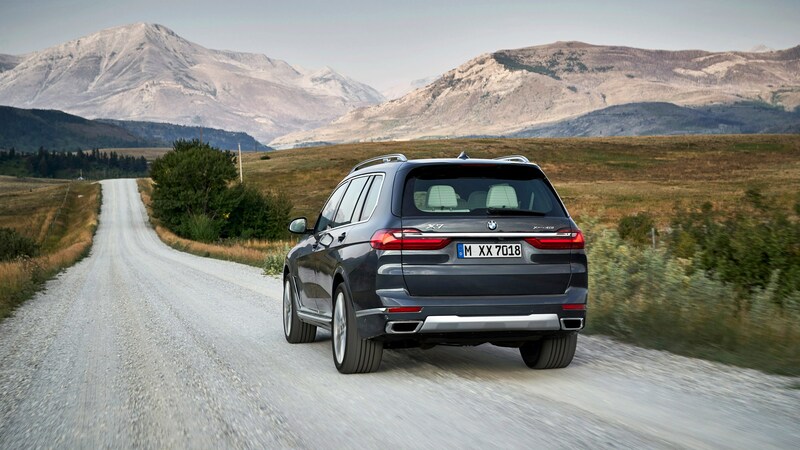 The X7 comes as standard with seven seats. Row two can be moved forwards and back by up to 14.5cm so you can flex the ratio between space for those occupants, or for people or luggage behind. The seat backs also split 60/40 as standard. Row two tilts forward to provide access to row three. It’s a bit of a squeeze getting back there and out again, but there’s decent space for two full-size adults once seated, and even armrests, cupholders, heated seats and the option of air vents and a climate-control panel. Row three also includes Isofix child-seat mounting points – not all seven seaters do, which means child seats have to be locked into row two, with the knock-on that accessing row three is harder for other passengers. Not in the X7. 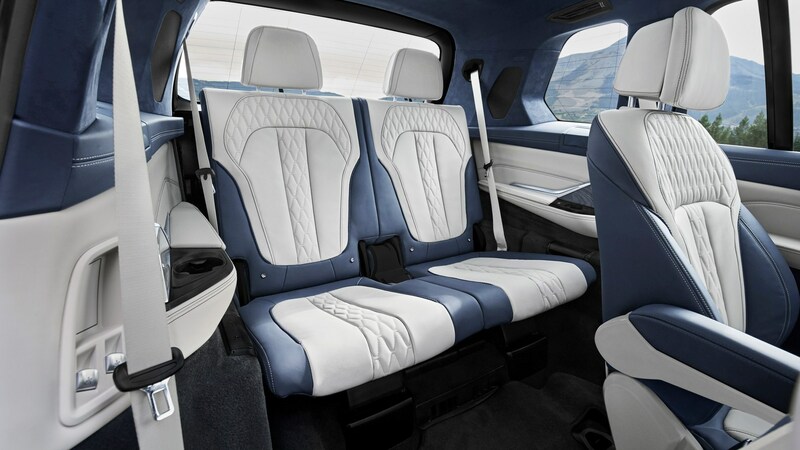 So if you’ve got a young family and regularly carry more than five, the X7’s rear Isofix is a real bonus. With all three rows raised, the boot is smaller than a Golf’s at 326 litres (the electric split tailgate actually helps to stop the stuff you’ve crammed in falling out) but row two and three can electrically lowered at the press of a button, providing 750 litres and 2120 litres of space respectively. A more opulent six-seat layout is available, which switches the middle-row bench for a pair of captain’s chairs. Clearly, you’ll need to leave one passenger at the kerb and you lose the ability to fold row two completely flat and carry really big loads, but there’s more space and comfort for the two remaining, and the gap between the seats makes getting back to row three easier. BMW predicts 40% of buyers will opt for the six-seater, and it’d be our recommendation unless the drawbacks already listed are deal-breakers. 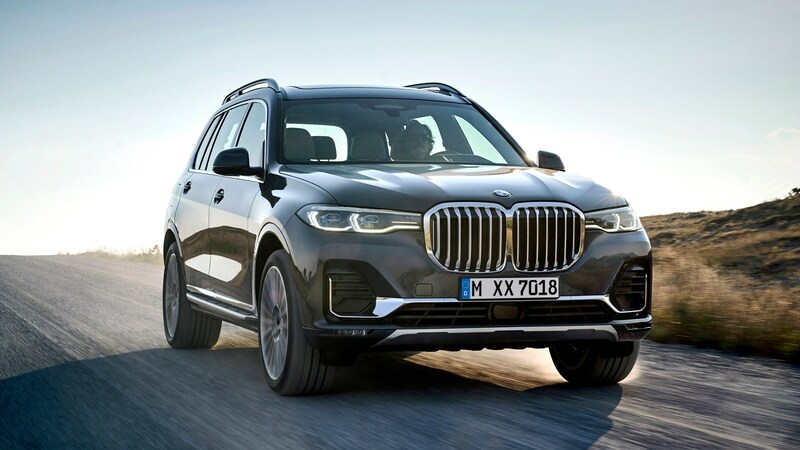 For a car that’s easy to dislike on account of its sheer bulk and those frankly monstrous kidney grilles, there’s actually a lot to enjoy once you’re aboard the BMW X7, and there’s no doubt its mix of luxurious refinement, seven-seat versatility and dynamic ability is unmatched by any rivals for comparable money.